The artist plays an essential role in any society, be it the ancient culture of Greece or the present community of Columbus. All the institutional support for art and artists--schools and academies, galleries, museums--recognize this role and yet what is often overlooked are the more immediate needs of the artist in terms of working space and community. No cohesive art network can exist without them and in cases where the arts have flourished, these elements have existed in abundance. The most obvious example might be New York, with its great number of industrial and warehouse areas that have been reclaimed by artists and populated as small art-intensive enclaves. Artists need space in which to realize their vision and a certain feeling of community from which to draw support and critical review for their efforts. Ideally, this could take place in one location but this was by far the exception in this country in 1988. 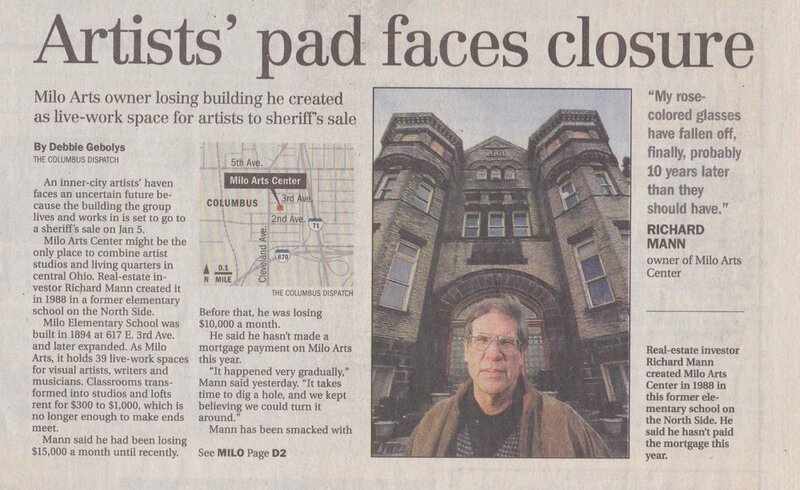 Now as well as then, in the state of Ohio, it is taking place in Columbus at Milo Arts. The building at 617 E. 3rd Avenue was built in 1894 in what was then Milo, Ohio. It was in continuous use as an educational facility for the immediate community until 1978, beginning as a school for all grades but an elementary school for most of its 84-year school history. After its closing in the mid-70s, the building stood vacant until it was purchased as a site for a flea market in 1978. A variance for commercial use was granted at this time and until 1982 it operated on the weekends as such. The first early group effort was aimed at a more specific self-definition, taking the form of a brochure. This was intended to provide a first-contact with the stated goals of Milo for the prospective tenant. However, all the applicants in 1988 and 1989 came to the old school building not from these modest advertising and promotion efforts but from word of mouth. Through whatever casual network exists among the performing and visual artists of Columbus, word of desirable and affordable work spaces was spreading through the community. From the beginning, there was a steady flow of applicants and interested visitors. New artists were joining the vision weekly, Rich Stadler, John Piper, Andrea Bihari, Sarah Slovick, Gretchen Cochrane, John McCutcheon, Jack Frost, to name a few. It became obvious that one of the first issues to be addressed by the newly-formed Milo Council was some kind of selection process for potential artist tenants. The demand for available spaces was always present, but the creation of a community dedicated to the serious pursuit of art and the ideal of cooperative living necessitated the establishment of certain admission criteria. It was determined that Milo would be a home for visual artists with the sincere desire to advance and develop their art, as evidenced by their work to date and their current directions. Furthermore, candidates were asked to contribute some measure of time to the common good of the Milo community through attendance of regular Council meetings and some form of service to the endeavor (this has taken the form of janitorial and maintenance work, community relations, canvassing, political activism, etc.). At first, selections were made through an informal interview process that was later codified into the Milo review process. Steve Dinse, who had suffered a long wait in his VW bus in the parking lot while the rest of the artists wrestled with the “Review Process”, became instrumental in its refinement. A questionnaire was developed that focused on four areas of an artist’s life – Art/Work/Character/Community in no particular order and has remained an integral part of the review process ever since. One of the significant aspects of participation in community affairs by members of Milo has been their involvement in the East 5th Avenue Akin Action Committee. One Milo resident currently holds an elected office and the school is now the bi-monthly meeting place for the group. We see our presence at these meetings as a first attempt to reunite and empower what was a traditionally a unified community, before it was split by the geographical boundary of I-71. Later, in 1992, through the efforts of former attorney turned playwright, Milo artist, Rick Hole, the surrounding neighborhood became an official “Commission District”. Until November 2016, Rick Mann served as a commissioner, holding the various offices of Treasurer, Secretary, Vice-chair and Chair during his 15-year tenure. Another unique aspect of Milo has been its ability to come this far without any public assistance. As an artist's building, it slips through the cracks of various established programs of assistance for low-income housing, multi-family housing and commercial redevelopment. State and federal arts funding is aimed at programming and not capital improvement. Because the concept of a residential-studio facility for artists are uncommon today in our city, and indeed throughout the state and the country, Milo has amassed a considerable debt in realizing our dreams thus far. The unprecedented nature of Milo’s intent has also created a certain confusion among municipal zoning and building officials. The history of our pursuit of the proper variance and supportive building plans is long and complex, wavering from tacit approval to notification of violation. Because there seems to be no legal definition of the specific use of an artist's studio, our viability as an institution has been in doubt from the beginning. The variance of 1989, permits in 1992, 2001, and 2012, and finally a” Certificate of Occupancy” in 2016 has removed that doubt. Much of this text is derived from the Milo Book assembled by one of Milo Arts founding artists, Scot Benefield. In April 1983, RCR investments acquired the building and established its offices as the sole tenants. Rick Mann of Heritage Properties and partner in RCR investments was drawn to the architectural presence of the 19th century structure and began his first efforts at preservation of what he saw as the unique character of the building. At this time, the deterioration of the building was quite advanced, and parts of the complex were virtually uninhabitable. In October 1984, the Victory Mission moved into the 1950s wing of the Milo building. Their purpose was to house the homeless and provide food and clothing to the needy of the area. The Mission eventually expanded to include the use of the gymnasium and several other rooms, as well as the kitchen and dining area. Measures were taken to make this feasible which included a new roof, new common men’s and women’s restrooms, and the miracle work of an engineer and beloved Milo icon, Bill Swain, who brought the ancient boiler system supplying the 1923 and 1894 sections of the building back to life. Ultimately the mission came to use about 60% of the building. At this time Milo saw its first use as studio space. Local visual artists and musicians, drawn to the spacious rooms and affordable rent, took up residence for varying terms, often modifying the spaces to fit their needs. There was no organization among them per se as they coexisted in peaceful anarchy. In April 1988 Victory Mission left without notice. Suddenly most the building's rooms stood vacant and it became clear that a more coherent program for Milo's use was now possible. 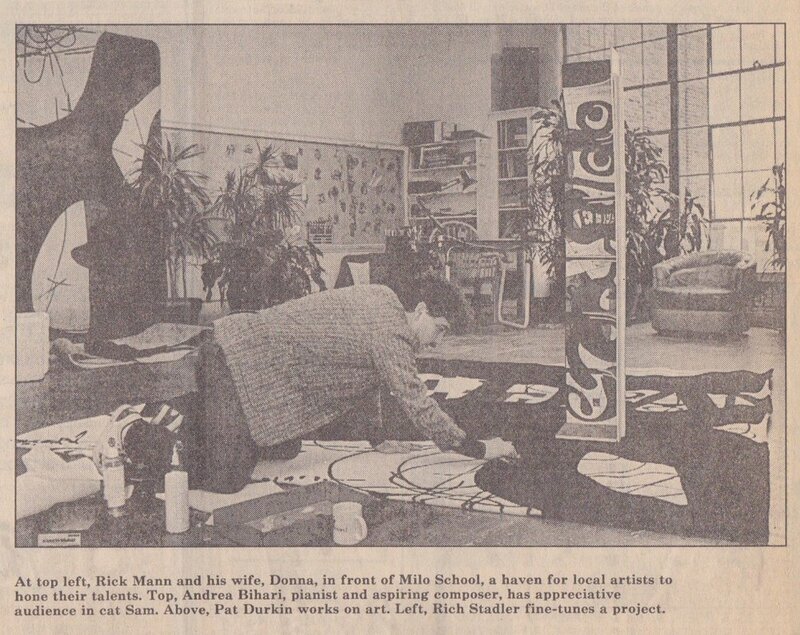 The idea of using the facility as an arts center came from the secondary tenants--at this time mostly visual artists--and was strongly supported by Rick and Donna Mann (an artist in her own right). On September 16, 1988, the first tenants were admitted by means of the new review process. These involved introductions to the current residents, familiarization with Milo's agenda, submission of a portfolio and an interview with a small number of residents. Milo grew with the democratic philosophy that each new tenant would have an equal role in influencing Milo's growth and development. This ideal of constant change insures that Milo, as an organic entity, remains responsive to the changing needs of its constituent members and avoids the pitfalls of any rigid dogmatic program. An interesting application of this ideal came when the first performance artists--as opposed to visual artists--applied for residency. Over the objections of the minority, the Council voted to accept the Moving Arts Company and thus altered the basic conception of Milo's mission to include a multi-disciplinary approach to the arts. We have since added artists and makers working in almost every conceivable creative format to our membership. Internally, Milo is run on the model of a town meeting with regular meetings held in one of the common rooms. These meetings are moderated by a member of Milo, with an open agenda that is posted in our mailroom. Each resident present at the meeting has one equal vote on all issues affecting the group (applicant reviews are not voted on at these meetings). There is a minimum of committee work and no standing committees, as we have found the group small enough to debate most issues as a body. Minutes are kept and issue developments are tracked and made available. providing a convenient way for new residents to become informed on the evolution of the Council. After 10 years of this structure and due to the evolution of communication and tracking capacity via the computer and the internet, Milo Arts governing systems have evolved as well. The development of these systems is currently ongoing. The history of Milo's involvement with the surrounding neighborhood dates from November 1988, when a survey of the surrounding houses was conducted by Milo residents. Intended as a means of greeting our neighbors and announcing our presence, it was also hoped that a computer data base would be compiled for future reference in offering workshops and classes. It was also an attempt to collect a history of the building for our archives, and an effort to understand how we fit into a larger community picture of the Milo area. A direct result of this initial survey was our first Open House, held in April 1989. In addition to opening our doors to the neighborhood residents (many of whom had attended Milo as an elementary school), we offered workshops in painting and dance for the children. By all accounts, the Open House was a success that led to relationships with members of the community that continue to this day. Another aspect of community outreach was realized with the first Neighborhood Clean-Up, held in cooperation with Habitat for Humanity and with the participation of the entire neighborhood. In September 1989 Milo was host to a neighborhood fair and flea market. The expanses of open space (formerly playgrounds and parking lots) on the site were filled with neighbors displaying wares and food vendors.